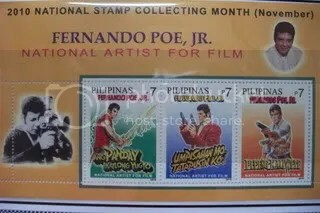 Last November 10, 2010 five stamps bearing the pictures of five national artists were unveiled at the lobby of the Philippine Postal Corporation at the Liwasang Bonifacio in the heart of Manila’s Cultural district. 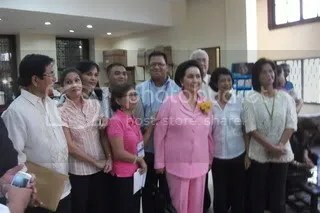 Mrs. Grace Poe- Llamanzares together with Philpost officials and relatives of the four other national artists as invited guests of honors before the unveiling of the stamps. Thousands of people from all walks of life had waited for several hours just to see the descendants of the five national artists. 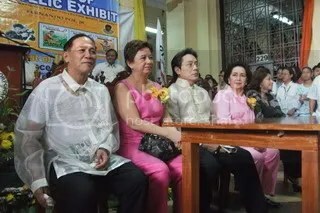 Among them is Mrs. Susan Roces –Poe wife of National Artist for Film the late actor Mr. Ronald Allan Kelly Poe or better known as Fernando Poe Jr. and his daughter MTRBC current chair Mrs. Grace Poe –Llamanzares . Mrs. Roces proudly showed the stamp images of FPJ in his iconic roles as Panday, Totoy Bato and Pepeng Kaliwete. Also included is his movie “Umpisahan Mo, Tatapusin Ko.” He was honored by then President Gloria Macapagal – Arroyo on May 24, 2006 through a Presidential Proclamation 1065 as one of the Philippine National Artist. His acting career spanned almost 50 years and had produced, directed and acted on several of his major films. tucked to his record is more than 130 movies and his films are highly acclaimed both here in the country and abroad. 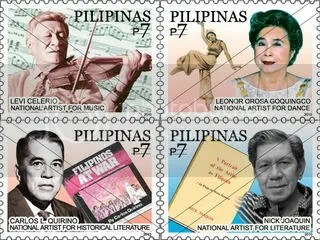 The FPJ commemorative stamps which includes four other national artists like Mr. Cornelio “ Levi ” Celerio – National Artist for Music , Mr. Nick Joaquin with his pen name “ Quijano de Manila – National Artist for Literature , Mr. Carlos Quirino – National Artist for Historical Literature and Mrs. Leonor Orosa- Goquinco – National Artist for Dance is currently selling at P65, is also a big boost to the campaign to promote letter writing in the age of electronic media, cell phone technology and social media. The author also personally met Mrs. Rosalinda Orosa a well-known columnist and an advocate for culture and the arts from the Philippine Star . She is the sister of national artist for dance Mrs. Leonor Orosa- Goquingco. 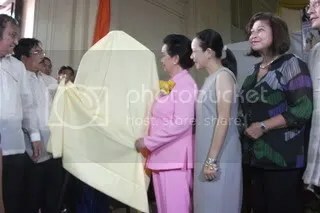 Mrs. Susan Roces- Poe , Mrs. Grace Poe- Llamanzares together with Philpost officials before the unveiling of the 2010 Philippine National Artists on stamps. The event started at past 10 am were each of the descendants or relative of the national artists were introduced to the public. Dozens of media networks like Kapamilya ABS-CBN channel 2, NBN channel 4, Kapatid network channel 5, Kapuso channel 7, UNTV channel 37 , bloggers and among others covered the event. “Nothing can compare to the personal touch in writing letters, and the smell that goes with love letters,” said Roces, who herself continues her family tradition of collecting stamps. 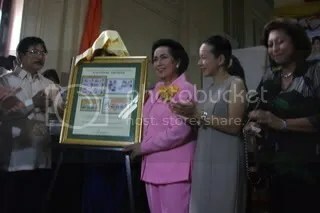 Mrs. Susan Roces also took time to view the stamp exhibit of Philippine stamps at the lobby. There was also a framed exhibit of NATOPEX 1961 photo of Roces promoting philately. 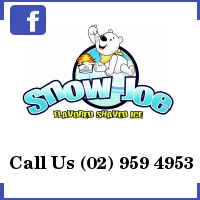 She said stamps and letter writing should continue in this Internet-driven age. 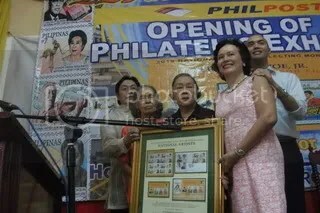 Unknown to many Mrs. Susan Roces- Poe is also a philatelist at heart and had been collecting stamps for more than 50 years ! Her topic includes Flora and Fauna on stamps. 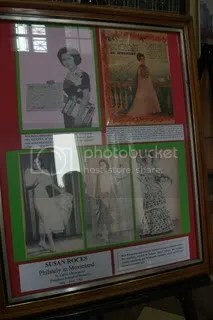 Philately in Movie land article by Mr. Carlos Manseguiao with Ms. Susan Roces ” Queen of Philippine Cinema ” which appeared on the defunct Philippine Journal of Philately from May to June 1962 mounted on a special frame. Llamanzares, meantime, has encouraged her mother to sign up on Facebook and other social media sites to connect to a new generation of fans. She quickly added that she will not press it. The event was also a venue where philatelists from all over the country and the world would buy first day issue of the stamps. 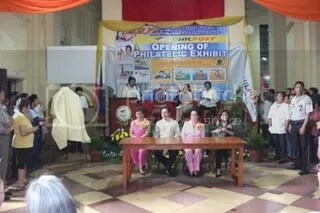 Every November, the Philippine Postal Corporation would celebrate their founding anniversary and it is also a venue were works of various Philippine National Artists would be featured on Philippine stamps. The country had a long tradition of issuing stamps , The first one being issued on February 1 , 1854 and was once Asia’s leading commercial stamp exchange post . The officials of the Philippine Postal Corporation attended the event. The author is among the thousands of people who waited for the unveiling of the stamps. relatives, descendants of national artist for dance Mrs. Leonor Orosa -Goquinco pose for a souvenir shoot at the lobby. Mrs. Rosalinda ” Baby ” L. Orosa a Philippine Star columnist is at the center . One of Philpost stamp advisory committee chair Gabot, a former commissioner of the National Commission for Culture and the Arts (NCCA) and one of those who voted for Fernando Poe Jr. as National Artist on Films. This is one of the biggest crowd to ever ensemble at the launching of a stamp in recent years. These stamps is highly collectible since only 100,000 copies were just issued . FPJ souvenir stamps and First Day Cover had a smaller quantity printed at just 5,000 copies . The author had a very memorable time talking with the descendants of the national artist and had several FDC autographed signed during the event .